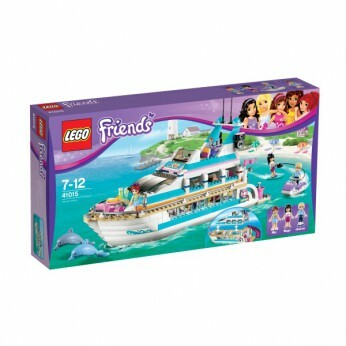 Go on a fantastic dolphin cruise with your favourite Lego Friends! This amazing dolphin cruiser features a waterslide, captains deck, kitchen, living room, bedroom, bathroom, shower, snack bar, a personal water scooter and plenty more accessories. You can even split the yacht to play inside! LEGO model number: 41015: Includes Mia, Maya and Andrew mini-doll figures. One supplied; Size H28.2, W54, D9.1cm; Weight 1.09g; For ages 7 years and over; EAN: 5702014972100. WARNING(S): Not suitable for children under 3 years old. Only for domestic use; To be used under the direct supervision of an adult. 1 Question 2 Answers Set course for an ocean adventure on the Dolphin Cruiser with Mia, Maya and Andrew. Steer the boat with Andrew and take the girls for a spin around Lighthouse Island! Shoot down the waterslide or go waterskiing with the personal water scooter when you find a great place to swim! Lay in the sun on the chaise lounges or search for dolphin friends with the sonar! Later, serve up snacks at the picnic table or blend up some yummy fruit drinks at the snack bar! When the sun goes down, open the Dolphin Cruiser to play inside. Get Mia and Maya ready for the party on the captain’s deck with a shower and some primping in the bathroom. Afterwards, hang out in the lower deck living room and tuck the LEGO Friends into cozy beds. Includes Mia, Maya and Andrew mini-doll figures. This toy costs approximately £49.97 (for the latest and best prices make sure you check our retailer list for the Lego Friends Dolphin Cruiser 41015 above). In our review of Lego Friends Dolphin Cruiser 41015 we classed it as being suitable for ages 6 years, 7 years, 8 years, 9 years, over 10 years but recommend you check the manufacturer specific advice before purchasing.